Learn more about Baton Rouge, Louisiana using the City Guide below. Plan a trip, find local shopping centers, or just discover what makes Baton Rouge, Louisiana so great! Baton Rouge is the capitol of the State of Louisiana, USA. From New Orleans Baton Rouge is an 80 mile northwest drive on Interstate 10, which drives into the heart of downtown Baton Rouge. Other major highways that will take you into Baton Rouge I-12, which will take you north of Lake Ponchartrain and bypasses New Orleans. From the west I-10 connects Lafayette, Houston, and Los Angeles with Baton Rouge. From the East I-10 connects Baton Rouge with Mobile and Jacksonville. If you're coming from Chicago, St. Louis, or Memphis follow I-55 South and merge onto I-12 West and continue driving for roughly 45 miles. The city's primary airport is Baton Rouge Metropolitan Airport, http://www.flybtr.com/, located in north Baton Rouge, near Southern University. It is served by Delta, Continental, Frontier, and American Airlines. The number and availability of non-stop flights have increased since Hurricane Katrina hit New Orleans in August 2005. African American Museum, 406 Charles Street (Located in Donaldsonville), +1-(225)-474-5553. Louisiana Art and Science Museum, 100 South River Road, +1-(225)-344-5272 (lasm@lasm.org). Baton Rouge Zoo, 3601 Thomas Road, +1-(225)-775-3877 (info@brzoo.org, fax: +1-(225)-775-3931). Hours: Mon. - Fri.: 9:30 - 17:00, Sat. and Sun. : 9:30 - 18:00. Admission: Adults: $5.50, Seniors: $4.50, Children (Aged 2 - 12): $2.50. Louisiana State Capitol, State Capitol Drive, +1-(225)-342-7317. LSU Rural Life Museum, Essen Lane, +1-(225)-765-2437 (rurallife@lsu.edu). Swine Palace Productions. Located in LSU's "theater-in-the-round" Reilly Theatre, originally a livestock-judging pavilion, Swine Palace are Baton Rouge's premier professional theater company. Shaw Center for the Arts. Located downtown, this is the city's newest major performing arts complex. It features the Manship Theatre and a rooftop sushi restaurant. Blue Bayou Water Park/Dixie Landin' . Located on the outskirts of town at the intersection of Interstate 10 and Highland Road, This is the largest amusement park in the Baton Rouge Area. The main attraction is the enormous waterslide "Conja". Raising Cane's, 14929 Market Street, +1-(225)-408-1658. Baton Rouge's home-grown chain of fast-food restaurants that serve only chicken finger meals, and have proven so adept at doing it that they have successfully expanded to other markets in the Gulf Coast region. Side items available include crinkle-cut fries, Texas Toast, cole slaw, and the mysterious-yet-addictive special dipping sauce. The Chimes. An LSU staple for generations, at the North Gates of campus on Highland. Predominantly frequented by students and faculty, The Chimes serves a mix of standards with Louisiana Cajun/Creole fare, and boasts one of the best beer selections in town. Parrain's. Although it is only a recent entry to the Baton Rouge eatery scene, Parrain's has already established itself as one of the best places to experience traditional Louisiana cuisine, most notably its fried seafood. TJ Ribs, 2324 S. Acadian Thrwy, +1-(225)-383-7427. Mon. - Sat. 11 - 23, Sun. 11- 22:00. The de facto standard for barbecue by which all other local BBQ restaurants are judged. Famous for pork and beef ribs, but also accommodates diners with other eating habits. LSU legend Billy Cannon's Heisman Trophy is on display here, as he exchanged it for lifetime eating privileges. $10 - $15. The Pastime. A half-century old pizza parlor and bar serving easily the best pizza in the city. Also the home of "Boudin Pizza", a unique South Louisiana concoction representing the collision of Acadian and Italian cultures. Fleur de Lis, 5655 Government Street, +1-(225)-924-2904. Hours: Tuesday - Saturday: 10:00 - 22:00. Baton Rouge's other half-century old pizza parlor, originally a gas station on the outskirts of town, the Fleur de Lis is a family restaurant with a dedicated old Baton Rouge clientele. Cash or check only. Tsunami. A sushi restaurant perched high above the city on the roof of the Shaw Center. The establishment boasts one of the best views in the entire city. Louie's. A traditional diner right at LSU's North Gate open 24/7. The Baton Rouge Metro Council recently outlawed many drink specials in establishments classifed as bars, so if you're looking to save a buck, you should stick with drinking in restaurants. However, if you're looking for that bar atmosphere, there are several places to choose from. Additionally, blue laws are still in effect in Baton Rouge - liquor cannot be purchased on Sundays, and as a result, bars are closed. The situation may change, however, when the issue comes up for a vote in October 2007. The Thirsty Tiger, 140 Main St., 225-387-9799. A downtown tradition, frequented by construction workers, state employees, and newspapermen for a generation. Terrific spot for cheap, cheap, cheap drinks. Port Royal, 2363 College Dr., 225-201-9900. The best pirate-themed bar located next to a Waffle House in all of Baton Rouge. A service industry hangout with a alt-rock leaning clientele. Chimes Restaurant and Oyster Bar, 3357 Highland Rd. (AKA The OC), 225-383-1754 (fax: 225-387-5413). 11:00-02:00 Mo-Sa, 11:00-23:30 Su. The largest selection of beer, both bottled and on tap, in the Capitol City area and maybe the entire state. They serve practically anything you can think of. If they don't have it, you probably don't need to be drinking it. Be sure to ask about "Drinking around the world". There are several reports of bottled beer being served past its prime, but anything on draft seems fine. The Chimes East, 10870 Coursey Blvd. (''between Airline Highway and Sherwood Forest Boulevard''), 225-296-4981. 11:00-02:00 Mo-Sa, 11:00-23:30 Su. A newer sister store of the Chimes Restaurant (above). Mellow Mushroom, 4250 Burbank Dr., 225-490-6355. A very funky, hippie-influenced decor, not much on the food, though the pretzels have a reputation. Churchill's, 7949 Jefferson Hwy. Suite C, 225-927-4211. "Premium Cigars & Elixirs", also frequently has live music and tastings. Baton Rouge (Airline Hwy) Microtel Inn & Suites, 10311 Plaza Americana Dr., +1 225-927-9997 (fax: +1 225-927-9994). Baton Rouge (I-10) Microtel Inn & Suites, 10645 Rieger Rd. (I-10 & Siegen Lane), +1 225-291-6200 (fax: +1 225-291-6202). Baton Rouge Marriott, 5500 Hilton Ave., +1 225 924-5000 (toll free: +1 800-228-9290, fax: +1 225-927-6709). Best Western Chateau Louisianne Suite Hotel, 710 N Lobdell Ave., +1 225 924-5000 (toll free: +1 800-256-6263, fax: +1 225-924-3074). Best Western Richmond Suites Hotel, 5668 Hilton Ave., +1 225 927-6700 (toll free: +1 800-332-2582, fax: +1 225-924-3074). Courtyard Baton Rouge Acadian Center, 2421 South Acadian Thruway, +1 225-924-6400 (fax: +1 225-923-3041). Courtyard Baton Rouge Siegen Lane, 10307 N Mall Drive, +1 225-293-7200 (fax: +1 225-293-0323). Fairfield Inn Baton Rouge South, 7959 Essen Park Ave., +1 225-766-9493 (fax: +1 225-766-9175). Holiday Inn, 10455 Reiger Rd, +1 225-293-6880. Holiday Inn, 9940 Airline, +1 225-924-7021. Holiday Inn Express, 4924 Constitution Ave., +1 225-930-0600. Holiday Inn Select, 4728 Constitution Ave., +1 225-925-2244. Motel 6 Baton Rouge East, 9901 Gwen Adele Ave., +1 225-924-2130 (fax: +1 225-929-7150). Motel 6 Baton Rouge Southeast, 10445 Reiger Rd., +1 225-291-4912 (fax: +1 225-291-8554). Residence Inn Baton Rouge Siegen Lane, 10333 North Mall Dr., +1 225-293-8700 (fax: +1 225-293-9169). SpringHill Suites Baton Rouge South, 7979 Essen Park Ave., +1 225-766-5252 (fax: +1 225-766-0797). TownePlace Suites Baton Rouge South, 8735 Summa Blvd., +1 225 819-2112 (toll free: +1 800-257-3000, fax: +1 225-819-2117). Travelling to or from Baton Rouge, Louisiana? 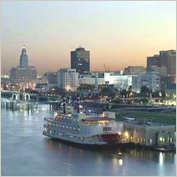 Find flight to or from Baton Rouge, Louisiana with an Online Travel Agency. Get lodging information or make reservations with a Local Online Hotel. Plan ahead and reserve a car with a Local Car Rental Agency. Are you relocating to Baton Rouge, Louisiana? Goods & Services in Baton Rouge, Louisiana.